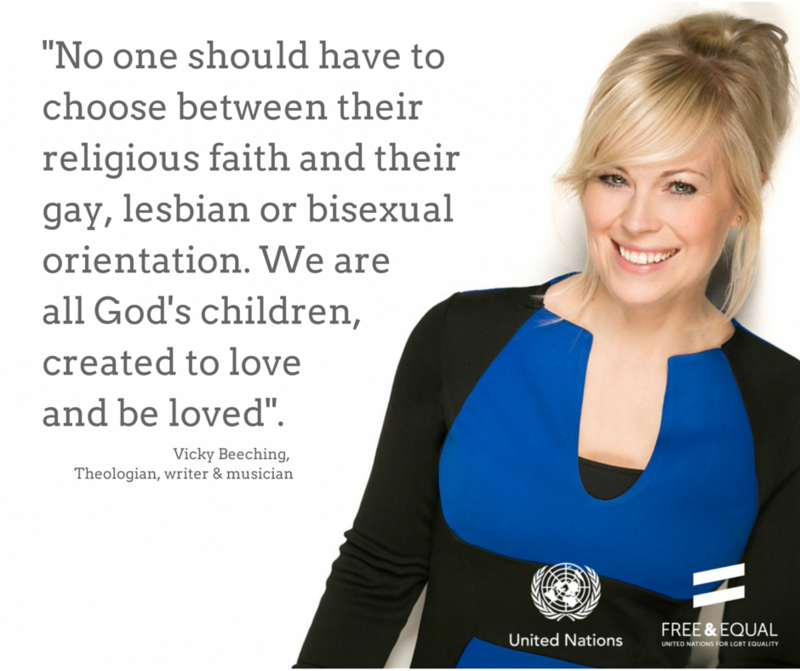 This article with Vicky Beeching is posted with the support of the United Nations campaign Free and Equal for the human rights of all LGBTI people across the globe. Whatever your opinions on homosexuality I think we must all begin this conversation and surely conclude that the basic human rights of safety, love and care should be available to all people on this earth regardless of their gender or sexual orientation. That is why I applaud this campaign because it transcends theology and dignifies the human being. We should all be entitled to live with dignity, love and compassion. Love Lisa. Free & Equal is an unprecedented United Nations global public education campaign for lesbian, gay, bisexual and transgender (LGBT) equality. A project of the United Nations Human Rights Office, Free & Equal raises awareness of homophobic and transphobic violence and discrimination, and promotes greater respect for the rights of LGBT people everywhere. The campaign engages millions of people around the world in conversations to help promote the fair treatment of LGBT people and generate support for measures to protect their rights. Homophobia refers to the unreasoning fear or hatred of homosexuals and to anti- homosexual beliefs and prejudices. It is based on the belief that heterosexuality is normal and natural and that homosexuality is unnatural, sick or dangerous. ‘Gay men and lesbians experience cultural invisibility, they are routinely told that their innermost feelings and desires are disgusting, dangerous, just a phase or non-existent, they are denied civil and legal rights and the recognition of their partners and relationships, their consenting sexual relations are criminalised and policed, and they are subject to verbal and physical harassment, bashings and even murders’. (Article – Mapping Homophobia in Australia. Australia Institute Webpaper July 2005 Michael Flood and Clive Hamilton). In 2004 a report commissioned by the NSW Attorney General’s Department showed that violence against gay men and lesbians had changed little in the last ten years. statistics show that gay people are six times more likely to commit suicide. People like Eleanor Roosevelt, Martin Luther King, Nelson Mandela, Mahatma Ghandi, and Aung San Suu Kyi have led the fight for human rights. Their work must go on until everyone enjoys the same rights – no matter who they are or whom they love. Vicky Beeching is a former Christian music star and a popular religious commentator and media personality. She has emerged as a leading voice for Christian acceptance of lesbian, gay, bisexual and transgender people. In 2014, she came out in an interview with a national UK newspaper. “No one should have to choose between their religious faith and their gay, lesbian or bisexual orientation. We are all God’s children, created to love and be loved. Jesus summed up his entire teaching in two commands: love God and love one another. The love he asked of us was not intended to be minimal or superficial; it must reflect God’s own heart – radical, limitless, self-sacrificial and shockingly inclusive. Yet sadly, despite this mandate of inclusive love, many origins of anti-LGBT sentiment stem from religion and from misinterpretations of sacred texts like the Bible. My own journey of feeling unable to be both Christian and gay left me fractured and scarred in many ways. Things must be different. In many churches discussions about faith and sexuality are seen as ‘too taboo’ to raise. In others those discussions have happened, but an inability to see eye-to-eye have left conversations at gridlock. Some churches have made positive strides towards inclusivity but often at great cost. One thing is certain: there’s currently a lot of inflammatory debate and division. Each church must arrive at its own conclusion about LGBT theology and that journey will take time. But now – today – there are crucial things around which every Christian community should be able to unite with energy and positivity; goals which even the most conservative and the most liberal of churches should be able to join forces: Hate-crimes against LGBT people are wrong. Violence, prejudice and bullying toward LGBT people are wrong. The high statistics of depression, self-harm and suicide among LGBT youth are shocking. These urgently require the attention of the church. We can be the generation to see change come and confine homophobia to the pages of history. Now is the time for every community of faith to stand up and choose love as their central ethos toward LGBT people. A vulnerable minority is urgently in need of the radical, protective and caring love God has commanded us to show. “Ending homophobia and transphobia is a great human rights cause”. 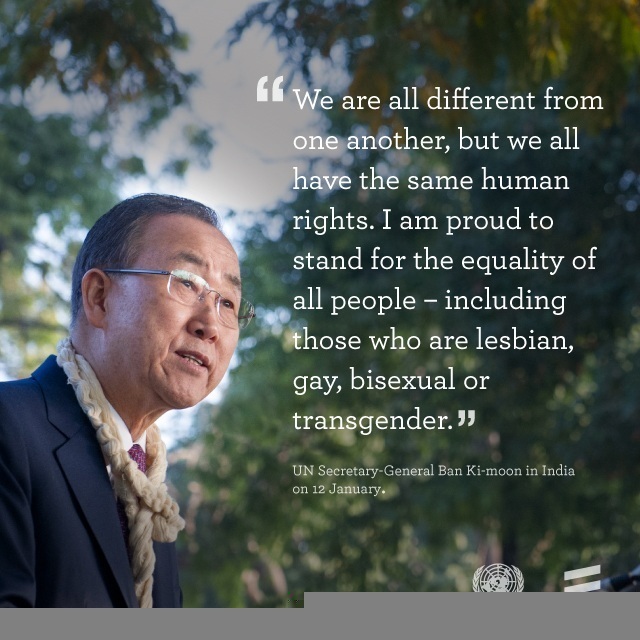 Under his leadership the United Nations have launched the Free and Equal campaign to fight for a future where no one will face discrimination based on their sexuality or gender identity. I am deeply impressed by the bold stand the UN are taking on this issue and am proud to support, advise and champion them in this work. So let’s refuse to allow the injustice of homophobia to go on for yet another lifetime. ​I urge Christian leaders, regardless of theology, to make love and compassion their mandate. To unite specifically around ending hate-crimes and addressing the high levels of self-harm, depression and suicide among LGBT teens. ​We can create the tipping point; the moment when this radical shift becomes reality. By sharing our resources and working across doctrinal divisions we could see lives literally saved. We need to act now. So let’s commit ourselves to working relentlessly, as the UN are already doing, until the day arrives when every LGBT person is finally as they should be: free and equal. ← Sexuality and Spirituality – ‘The Link’ by Deb Hirsch. my thoughts have been that gay rights are human rights; the right to being treated with dignity. To feel safe and not feel as though one is in physical danger because of their orientation. To not be referred to by slang they find derogatory. These are some of the many ways, as Christians, we can make sure those who are LGBorT feel welcome and not threatened. Yes you are right. No male No female No slave in the eyes of Christ we are all one.